Sunday I went on what was one of the most memorable runs so far in my running career. This is how one of my running buddies summed it up on Facebook: Some runs are, well, just runs. And some runs are MEMORY runs! This afternoon’s run will be one of those memory runs. Cold, cloudy day…running on the country roads…not really sure where we were…cars driving too close…rounding the corner and being happy at the downhill only to look straight ahead into the face of “mile-high hill”….having to stop at an “almost stranger’s house” to use the potty…being colder at the end of the run than you were at the beginning….and doing it with 6 other wonderful Running Buddies! Great run!! Two years ago if you would have told me that I would run 10 miles in 24 degree temperatures, on hilly, country roads in the wind, I would have said: No way! Not me! And yet, that’s exactly what I did on Sunday. How did I do this? Why did I do this? Because I have figured out what motivates me to achieve my running goals. And you can do the same. No matter what your goals are – to get more organized, run a half-marathon, lose weight or something else altogether – when you figure out what motivates you to keep moving forward, you’ll not only increase the speed of achieving your goal, but you’ll enjoy yourself more in the process, too. Here’s what works for me when it comes to running, along with ideas for figuring out if these ideas would motivate you to achieve your goals, too. One of my biggest running motivators is my running buddies. When I signed up for my first half-marathon, I asked all the runners I knew if they wanted to sign up, too. This way, I had friends to share my journey with – like training victories, stomach issues, and my ankle injury. They shared their victories, too, which kept me motivated, and they shared tips and ideas for addressing the bumps in the road on my training journey. What’s more, they ran with me on long runs. (Talk about motivating.) There’s no way you’re going to skip a run when you know someone else is counting on you to be there. Would this motivate you? I’ve always said everything is more fun with friends along for the ride, and with running, this is definitely the case for me. Do you find it more fun and motivating to do things with friends? If so, look for ways to build your friends into your goal achieving journey. Find an accountability buddy, or join a class with an online community for support and motivation. Or, look for ways to physically get together to accomplish your goals, whether it’s exercising together, organizing together, or taking a class together to learn a new skill. Would this motivate you? Chances are pretty good, no matter what your goal is, a plan will help motivate you to make it happen (for all the same reasons my training plan helped me.) You’ll feel more confident that the steps you’re taking will actually work, and you won’t get stuck trying to figure out what to do next. If you like to make plans, then create a simple plan on your own by brainstorming steps you could take in the direction of your goal. Then, put them in the order that makes sense to you and get busy taking action. Alternatively, if you aren’t really sure how to accomplish your goal (like I was with the half-marathon goal) find out what others have done to accomplish what you want to do. Ask friends or do some research online to find a plan that’s a good fit for you. Then, as always, get busy taking action. As you know, around here our motto is “more fun. more done.” So, it goes without saying that I’m a fan of anything that makes it more fun to achieve a goal, and that’s what fun gear is. For running, one of my current favorites is my Nathan Trail Mix Hydration Belt. This allows me to run hands free, but still have essentials like water, my car key, tissues, my phone and my Shot Bloks with me while I run. This is very motivating when going on a long run. Would this motivate you? Fun gear can be both a motivation and a reward for accomplishing a goal. 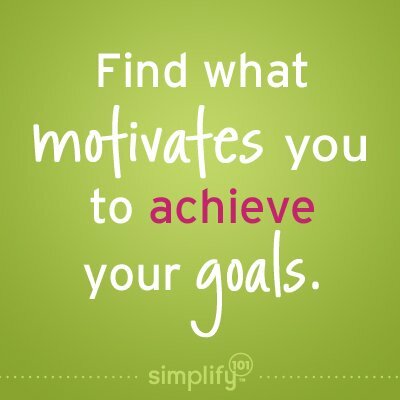 Are you motivated by rewards? Do you like fun stuff? If so, look for fun goodies that will truly help you achieve your goals by taking away a barrier, or by providing a tangible incentive for completing your goal, project or a significant milestone. Build-in breaks and recovery time. My training plans always have rest days…and I treasure them. Additionally, after long runs I build in some recovery time, too. One of my favorite ways to recover is to put on some cute compression socks and kick my feet up. (My current favorites are Marvy socks.) Now, if you aren’t familiar with compression socks, the reason runners love them is because they increase circulation, which energizes tired legs and feet and speeds up post-workout recovery time. Plus, remember the bit about fun gear? Well, compression socks fit that bill, too. Learn more about compression socks and their benefits. Would this motivate you? Building in breaks is a terrific idea on your goal journey. Your body and mind needs time to recover and re-energize. If you tend to go all in on your goals, and then burn out, consider this strategy this time around. Better yet, take it a step further and create a fun resting ritual, like donning compression socks or doing something that relates to your goal). This will make your break even more meaningful and ultimately more motivating. Make it easy to take action. I blogged about my running mini zone before, but I wanted to mention it here because it plays a role in keeping me motivated to run. 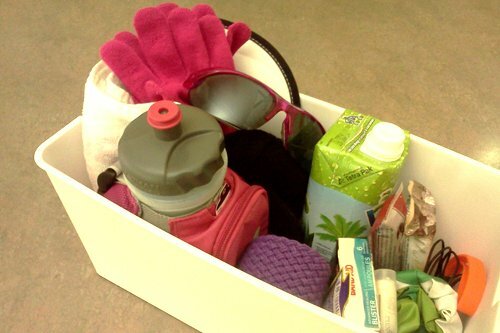 Here’s why: getting ready to go running is so much easier because everything is stored in one handy spot. This removes one barrier (or excuse) that would make it easier to talk myself out of running. So there’s a round-up of what’s motivating me these days to keep running…even when it’s only 24 degrees outside! These ideas may line up really well with your goals, or you may need to brainstorm other ways to rev up your motivation for your specific goals. Maybe a vision board is more motivating to you, or perhaps all you need is a simple list of benefits or reasons why you’re going after your goal. My final idea is this: simply play around and try some ideas on for size until you find your magical motivation formula. It may vary from goal to goal, and that’s fine. Just keep trying things until you find what motivates you to keep moving forward! What motivates you to keep moving forward on your goals and projects? I’d love to add your ideas to the list! Thanks for joining the conversation. P.S. My self-paced online class How to Achieve Your Goals + Create a Life You Love gives you a proven system for setting and achieving your goals. With the self-paced format you can start anytime you’d like. (Even today!) Go here to learn more about my goal setting class.